Bravery and stupidity often go hand in hand. When the bravery pays off in victory, you look the hero. When the bravery punishes you with pain, you look like you made a foolish choice. 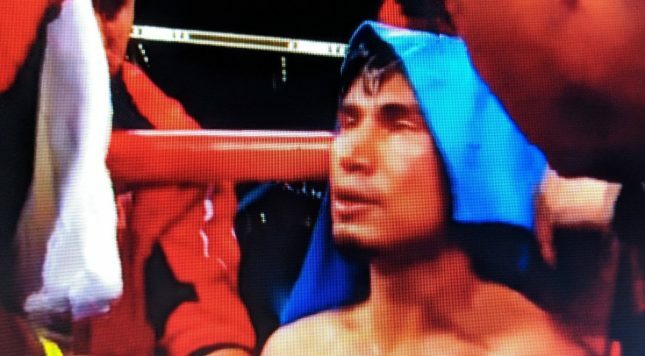 Mikey Garcia isn’t stupid in the ring, but Saturday night on Fox Pay-Per-View, his decision to move up to welterweight against one of the elite boxers in the whole sport sure proved a mistake. And if that wasn’t bad enough, Errol Spence, Jr. was smarter than him over the course of the fight, too, thrashing the smaller man badly while outboxing him, too. Spence, who hits harder than most any welterweights anyhow, didn’t just have a size advantage, although size is a force multiplier for skill. He was faster, too, and as the smaller man, Garcia didn’t carry the traditional advantage one can seize by moving up. It was good for a unanimous decision of 120-107, 120-108 and 120-108, meaning Garcia didn’t win a single round and one round was so bad a judge docked Garcia an extra point. You don’t want to come down too hard on Garcia for taking a risk few boxers would be willing to take. Garcia was at his peak at featherweight and junior lightweight, and has seen diminishing returns at lightweight and junior welterweight. Welterweight was really too much, but against Spence? Even worse. You wonder if he didn’t just artificially shorten his career. The moral victory he scored for going 12 rounds probably isn’t worth it. You can knock Spence for not stopping the smaller dude, maybe, if not for the fact that Garcia, despite being outsmarted and outworked (Spence’s jab and alternating left hands were terrific) was smart enough to avoid getting KO’d. Garcia was, like Spence, one of the top 10 pound-for-pound fighters in the world coming into this. Garcia was nearly on the verge of a KO loss or his trainer stopping it in going into the 10th, but turned it on to such a degree he earned the chance to fight, whatever good that did. Meanwhile, Spence was just better in every way, and it’s not like a few smart wags didn’t think Garcia would be able to outbox Spence despite the size difference, when in fact the opposite happened. If anything, this win elevates Spence because of how he did it, more than that he did. Spence clearly wants Manny Pacquiao next, and who can blame him? Pacquiao is still a huge star and he’d earn Spence swimming pools full of cash. Arguably the best fight in the sport, Spence vs. Terence Crawford, is even better, though. Would that Spence would summon some of Garcia’s bravery and figure out a way to force Spence vs Crawford despite the promotional and TV rights gaps that he’d need to overcome.